Check Aer Lingus Baggage Size Restrictions, Plus Baggage Fees Before You Fly. You don't need to worry about going over Aer Lingus's baggage allowance if you just send all of your luggage to your destination instead of lugging it behind you throughout your journey. Find out how cost effective it is to send your luggage, especially as you will avoid the hassle of paying excess baggage fees. Your luggage won't cause you any hassle at all, in fact; you can simply have it waiting for you at your hotel when you arrive. 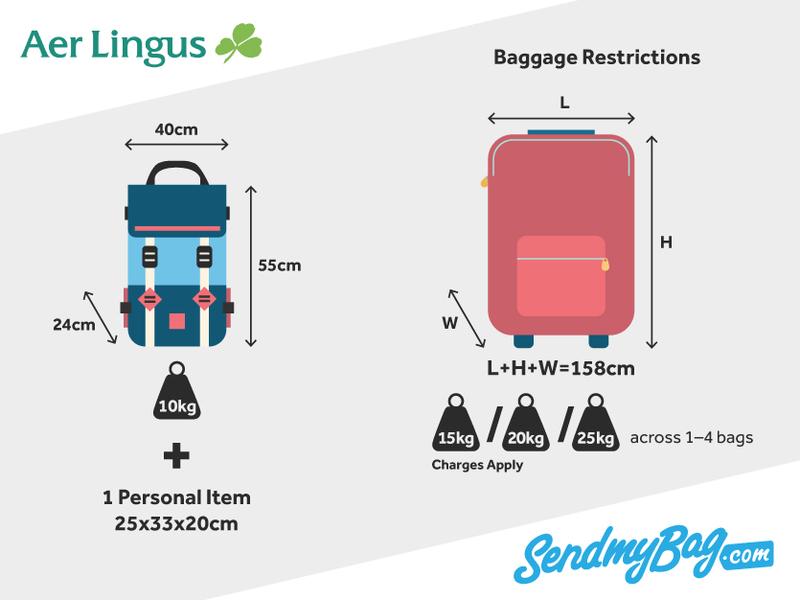 Passengers on Aer Lingus flights are allowed to carry one item of hand luggage weighing up to 10 kg and measuring no more than 55 x 40 x 24 cm, as well as one small personal item, such as a handbag or laptop, with maximum dimensions of 25 x 33 x 20 cm. Infants under two years of age do not have their own cabin baggage allowance; any luggage for the child's use forms part of the accompanying adult's allowance. what if my Carry-On is overweight/ oversized? If your hand luggage is too heavy or too large, it must be checked into the hold, and the relevant fees must be paid. You can bring smaller instruments on board as standard hand luggage, provided they fit within the permitted dimensions and weight restrictions. For medium-sized instruments you may purchase an additional (window) seat. This item must not exceed 75 kg or 94 x 58 x 41 cm. When travelling on a transatlantic flight, on an ‘Economy Smart/ Flex’ fare, 1 x 23 kg bag is permitted free of charge, with maximum dimensions of 158 cm. It costs €75 for second and subsequent bags. How much luggage you are allowed to check with Aer Lingus depends on whether you are travelling within Europe or on a transatlantic flight, and how far you are travelling (i.e. near, mid or far routes). You can add up to three extra pieces of luggage for €10 each but these must be included within the weight allowance you are paying for. You would be expected to pay €10 per kilo of excess luggage on flights within Europe and €75 per overweight piece on long-haul flights. You are permitted to check sports equipment into the hold but are only allowed one item per person, with no item exceeding 23 kg in weight. On transatlantic flights, a sports item can be checked as part of your free baggage allowance, but if this brings you over your free allowance, a fee of €75 applies, one way. On flights within Europe the fee for checking sports equipment is €40, one way, if paid online, or €50 at the airport or by telephone. Some items, such as bicycles, must be booked by telephone. Musical instruments under 55 x 40 x 24 cm can be carried as hand luggage, and larger items, such as a guitar, can be carried on board if an additional, window, seat is purchased for it. Even larger items can be checked into the hold, on payment of a special handling fee. In October 2017 Aer Lingus' passengers travelling across the Atlantic on a 'Saver' ticket will no longer receive little in-flight 'luxuries' such as blankets and headphones for free. Nor will they know in advance which seat they will be occupying, nor will they be allowed to check a bag free of charge. 'Saver' passengers will have to fit all of their luggage into a 10 kg hand luggage allowance. This sounds a little tricky given that most passengers travelling across the Atlantic tend to stay at their destination for at least a week and will, therefore, struggle to fit all they need into this small baggage allowance. If you are tempted by Aer Lingus' 'Saver' fare but you need to have more luggage with you, you could just send all of your luggage with Send My Bag. This works out well for those who are relocating across the Atlantic and who have too much luggage to make any of Aer Lingus' higher fares cost-effective for them. Passengers who are relocating can then take advantage of the 'Saver' fare for their own transport, while their luggage is taken care of for them by Send My Bag. Looking for Aer Lingus sized hand luggage?